The concept of the iconic Red Special original has become so much a part of the Brian May legend that it has perhaps becomes hard to separate the guitar from the man but we're certainly not alone in believing that the instrument deserves way more credit for its potential to achieve... well, pretty much ANYTHING you could desire from an electric guitar! As so many reviewers, players and customers already know, the unique combination of pickups, wiring scheme and switching system chosen by Brian, faithfully recreated on the BMG Special and Super models, make these inspired instruments devastatingly versatile. To help illustrate the wide range of tonal variation available from Brian May Guitars, we are indebted to LUCAS VIANNA for sharing this superb video and audio demo. 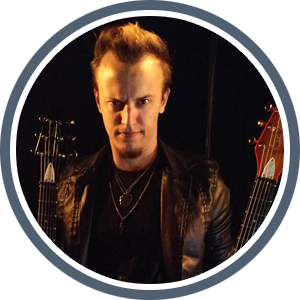 An amazing young guitarist, Lucas is fast becoming a We Will Rock You veteran, having performed in the 2016 Brazilian and 2017 Danish productions of the Queen-inspired hit musical. Here, he presents a in-depth video tour of the BMG Special that, along with audio performances of the different switch settings and digital modelling presets, will help you to become intimate with the instrument's idiosyncratic set-up and quickly get you on track creating your very own #BMGstyle. One of Brian May's favoured settings, this is an extremely versatile configuration for both rhythm and lead parts. Using the volume to control the amount of gain, you can dial in a bright, clean sound ("Under Pressure", "Save Me") or, by bringing the volume up to around halfway and digging in - preferably with a sixpence - the distinctive crunch of "Tie Your Mother Down". Winding the volume full up and the powerhouse riffs of "Hammer To Fall", "One Vision" and "I Want It All" ring out loud and proud. Switching from Vox to a brace of different Marshall driven patches with the same pickup configuration also yields devastatingly accurate takes on the iconic sounds of Jimmy Page and Eddie Van Halen. By stark contrast to the "bread and butter" humbucking response of bridge and middle pickups combined, switching the two out of phase to one other produces a characteristic sharp and funky percussive tone. A perfect setting for the first staccato section of Brian's "Brighton Rock" solo as well as the crisp lead breaks on "Crazy Little Thing Called Love" and "Killer Queen". This set-up is used - at full volume, naturally - for the bass-heavy, breakout rock section of "Bohemian Rhapsody" and, with the tone control turned down, for Brian's cello-like orchestrations. And, as Lucas demonstrates here, it's a tone equally well suited to balls-out, rootsy rock 'n' roll from an entirely different era. Brian's classic "out-of-phase" sound. Played hard, with a tube amplifier cranked up and full volume on the guitar, the phase cancellation between the two series wired pickups creates the distinctive, creamy, screaming tone of the solos on "Somebody To Love" and - of course - "Bohemian Rhapsody". Lucas with his WWRY São Paulo partner-in crime Fábio Stamato. As used on classic Queen riffs like the corrosive, palm-muted, 16th note opening to debut single "Keep Yourself Alive" and the proto-speed metal of "Stone Cold Crazy", the former utilising a distinctive phasing effect with the volume at 50%, the latter with the on-board volume full-up. Producing a rich, full. yet controllable sound at lower volumes, Brian has used this setting for the delicate arpeggios on live performances of "These Are The Days Of Our Lives"
A great setting for the strident funk-rock of "Dragon Attack", with the volume wound down to 50% - 75%. Alternatively, crank it up, full-tilt boogie style for corrosive Angus Young style stadium-filling riffs, Metallica's ominous powerhouse attack on "Enter Sandman" or a neat version of Mark Knopler's Billy Gibbons inspired, cocked-wah driven sound from "Money For Nothing". Proving beyond all doubt what an amazingly versatile instrument the BMG Special truly is, Lucas Vianna ably demonstrates the insane breadth of styles and tones that this instrument is suited to. Very few guitars will provide the means to travel all the way from Ed King's breezy, southern fried picking, through David Gilmour's spacious, progressive blues-phrasings and Ritchie Blackmore's hard rock fireworks to Kurt Cobain's savage garage punk call to consciousness.... all on just one pickup!! Lucas recorded the parts for his video performance using his BMG Special through AMPLITUBE - IK Multimedia's popular virtual amplifier modelling/multi-effects processor (available as a multi-platform standalone app and plug-in) and he has kindly shared the various settings as presets for you to download to use for your own home recording or performance projects. He has also prepared the track settings as a text file which may be useful for users of other software amp simulators (Native Instruments Guitar Rig, Line 6 POD Farm and Mobile POD, Agile Partners AmpKit, Positive Grid BIAS FX, Overloud TH3, Peavey ReValver, Waves GTR, Avid Eleven, Apple MainStage etc.) to adapt and experiment with, as well as for players with access to real world equipment to develop their own new and exciting #BMGstyle. More information about individual Queen song settings can be found HERE at Mike Ryde's excellent site dedicated to all things Brian May equipment related. Premier Guitar presents the definitive guide to the "BM sound" in this exclusive interview with Brian May and guitar tech, Pete Malandrone during Queen's Summer 2014 tour with Adam Lambert. Here, you will find EVERY aspect of Brian's current live set-up explained... from Sixpence's, strap-on Treble Boosters and effects units to the mighty AC30 wall of sound and his guitar arsenal, including, of course, the Red Special itself. The official site for Brian May and Simon Bradley's superb Red Special bible, published by Carlton Books. News, tours, interviews, forums and official merchandise. The Official International Queen Fan Club... 40 years and counting. The latest news on productions of the hit Ben Elton/Queen musical around the World. The home of the AC30. Australian master luthier and Treble Booster guru. Fine handcrafted electric guitars from Andrew Guyton. Website of Japanese master craftsman, Kazutaka Ijuin. Deacy Amps and the strap-mounted Treble Booster. Traditional hand-wound, "Great British" pickups. Electronics genius and the "Professor Quatermass of live rock ’n’ roll"
Home of the G-MAJOR 2,, the industry standard processor behind Brian's live FX set-up. California based creators of the famous Crybaby wah pedal. British loudspeaker innovators, founded in 1924 and acclaimed as "the voice of rock 'n' roll". Comprehensive guide to Brian's guitars and gear as well as owner's lists, interviews, photos, reviews and an overview of commercially available replicas and equipment. Owner's gallery, forum and a thorough guide to Red Special maintenance. A public Facebook group where a lively team of enthusiasts discuss and share anything relating to Brian May, Queen, Red Special guitars, amplifiers and equipment. Guitarist & studio engineer Mike Ryde's personal guide to Brian May's guitars and equipment. A vast repository of Interviews, photos and equipment reviews. An insanely vast & painstakingly researched chronicle of every single Queen gig.... ever! Includes set-lists, ticket stubs, crew and equipment details. Features an in-depth analysis of Queen songs and album releases, a huge archive of guitar, bass vocal and drum tabs, chords and piano arrangements plus an interesting section on Queen studio recording sessions. A popular YouTube channel dedicated to the music of Queen and Brian May presented by tutor James Rundle. Aimed at the beginner and intermediate player, his easy-to-follow video lessons are presented complete with guitar tab. Superb series of online lessons and DVD tuition including several titles dedicated to Queen and Brian May.